There are a number of potential reasons for the smartphone gap. 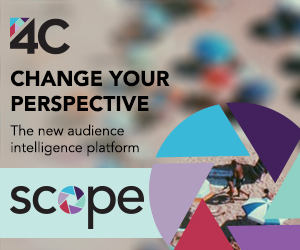 In an interview, Brian Dutt, who oversees FreeWheel's report, told me he believes that a combination of the smartphone's smaller screen, lack of Nielsen OCR measurement, shorter-form content that doesn't carry mid-rolls like long-form, Android fragmentation and a lower level of buyer comfort with mobile in general are all in play. All of that sounds right to me. Because the vast majority of smartphone video is short-form, there's sensitivity about how even a short pre-roll ad - which sometimes can be longer than the content itself - might diminish the user's experience. Whereas the desktop allows viewers to click away while the video ads run and then return when they hear the content again, on smartphones and tablets that's not possible. Content providers are still in the earliest stages of trying to find the right balance between ad load and user experience in mobile. The result for now at least, is that on average there is less than one video ad for each smartphone-based video viewed. Brian said that as content providers put more emphasis on mobile, FreeWheel is advising them to do A/B testing to gauge completion and abandonment rates. 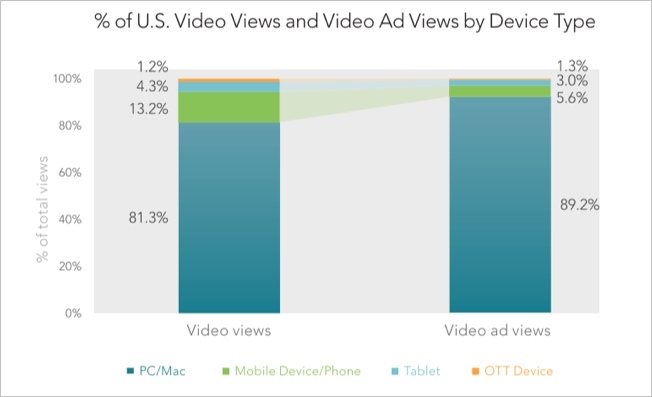 It's worth noting that 81.3% of the video in the FreeWheel data set is still viewed on the desktop. That underscores how leading edge VEVO (which happens to be a FreeWheel customer) is, with more than 50% of its U.S. views now on mobile, tablet and connected TVs. Beyond mobile, FreeWheel again broke out views by customer type: "Linear+Digital" (TV networks with online distribution) and "Digital Pure-Plays" (online-only content providers). Once again, DPPs grew views faster, with a 41% YOY growth rate vs. Q2 '12. L+Ds had a 32% growth rate YOY, which reversed a Q1 '13 decline of 8% vs. Q1 '12. Overall video views grew by 38% from Q2 '12 to Q2 '13. Last but not least, FreeWheel included completion rate data for DPPs and L+Ds for 15 and 30-second spots for the first time in the Q2 report. With the exception of DPP post-rolls, which had a completion rate for 15s of 43% vs. 61% for 30s, completion of 15 and 30-second placements were within a few percentage points. This suggests that viewers are basically indifferent to the ad length of individual ads, although it's not clear what the effect of total ad pod length or composition of ads within a pod are on total pod completion (i.e. mix of more 15s and fewer 30s or vice versa). As always, the quarterly report is free and available for download.